Proper gutter cleaning is the most challenging and dangerous home maintenance to tackle without professional help. It might not be the ideal D.I.Y project but it is no problem for our Gorillas! Our Mission gutter cleaning is always in demand and our technicians can always deliver. 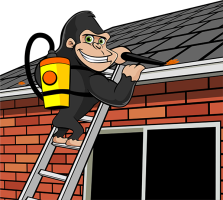 Why bother taking chances on your service, when you can have our Gorillas do the dirty work for you? Our technicians approach your property as though it were our own, taking the utmost care before beginning any work. An essential step, for example, is the use of fall arrest or restraint measures when the pitch of the roof is very steep. Our technicians also use ladder ‘stand-offs’ and ‘feet-levelers’ to make certain the ladder is always secure. Their own, and our clients’, safety is a priority for our Gorillas. Mission Gutter Cleaning is definitely one of the busiest services we offer our clients thanks to B.C.s dependable rainy season. Keeping those gutters free of debris and allowing rain water to flow freely is vital. Our Mission Gutter Cleaning team’s assignment is to make sure all of the gutters are vacuumed clean and downspouts are water tested for blockages and leaks. High definition pictures are taken before work commences and after it is completed. This way, our Mission Gutter Cleaning clients can see exactly how bad it can get up there without having to hike up a ladder. Like all areas in the Lower Mainland, the Fall and the Spring are the regular seasons for Mission Gutter Cleaning, although it can be done at any time of year. So, why wait until Fall or Spring? Give the Gorillas a call today. We’ll pop out and give you a non-obligated, hassle-free quote on getting those gutters spotless!